Fraunhofer is producing alcohol and acetone at its fermentation facilities, using the synthesized gas from the steel plants. Fuels and specialty chemicals can be procured from these. 03-Jul-2015: Carbon monoxide-rich exhaust gases from steel plants are only being reclaimed to a minor extent as power or heat. Fraunhofer researchers have developed a new recycling process for this materially unused carbon resource: They successfully produced fuel and specialty chemicals from these exhaust gases on a laboratory scale. The exhaust gas masses that arise from steel manufacturing plants are gigantic: the chimneys of the Duisburg Stahlwerke alone unleash several million tons of carbon dioxide. Fraunhofer has developed a process by which these exhaust fumes can be reclaimed and recycled into fuels and specialty chemicals. With the aid of genetically modified bacterial strains, the research team ferments the gas into alcohols and acetone, convert both substances catalytically into a kind of intermediary diesel product, and from this they produce kerosene and special chemicals. Participants include the Fraunhofer Institute for Molecular Biology and Applied Ecology IME in Aachen, as well as the Institute for Environment, Safety, and Energy Technology UMSICHT in Oberhausen and the Institute for Chemical Technology ICT in Pfinztal. The technology came about during one of Fraunhofer’s internal preliminary research projects and through individual projects with industrial partners. The patented process currently operates on the laboratory scale. “From our viewpoint, the quantities of carbon alone – which rise as smoke from the Duisburg steelworks as carbon dioxide – would suffice to cover the entire need for kerosene of a major airline. Of course, we still have got a bit to go to reach this vision. But we have demonstrated on the laboratory scale that this concept works and could be of interest commercially. In addition to the exhaust gases, syngas – similar gas mixtures from home and industrial waste incineration – can also be used for the engineered process,” explains Stefan Jennewein of IME, who is coordinating the project. The biochemists at IME use syngas – a mixture of carbon monoxide, carbon dioxide and hydrogen – as a carbon resource for fermentation. Using bacterial strains of the Clostridium species, the syngas transforms either into short-chain alcohols like butanol and hexanol, or into acetone. To do so, IME engineered new genetic processes for the efficient integration of large gene clusters in the Clostridium genome. At the same time, Fraunhofer further expanded its syngas fermentation system and used it for experiments with the steel and chemicals industry. 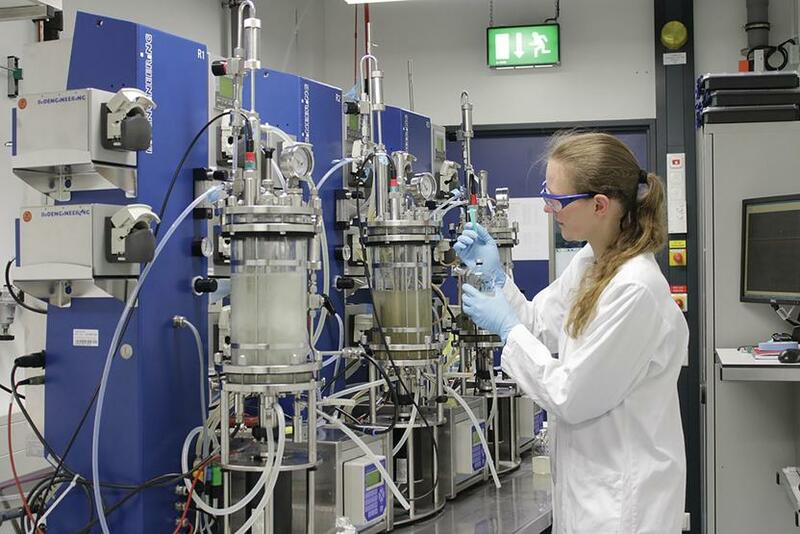 The chemists around Axel Kraft at UMSICHT evaporate the residual fermentation products and in a continuous catalytic process, couple the fermentation molecules into an intermediate product consisting of long-chain alcohols and ketones. This interim product already meets the standards for ship diesel, and, like fats and oils, can be converted through hydrogenation into diesel fuel for cars or kerosene for planes. Kristian Kowollik from the environmental engineering department at ICT obtains specialty chemicals from the interim product connected with this, which already can now directly replace petroleum-based products. For example, amines can be used in the pharmaceutical industry or the production of tensides and dying agents. 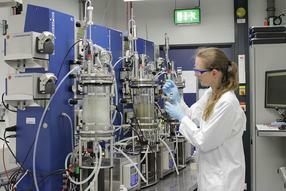 “The products synthetically produced by us can be used both as fuels as well as speciality chemicals. Exactly like this has worked until now with petroleum as the raw material source,” states Jennewein. In the next stage, the scientists strive to demonstrate that their technology also works with large quantities. “Over the next one-and-a-half years, we aim at gaining a better understanding of the processes, and to optimize them. Our goal is to apply for certification processes for the fuels. That is how its viability for practical use will be officially validated. For vehicle diesel, that takes about one year, and for kerosene about three years,” Axel Kraft adds.